The Seven Hills of Rome east of the Tiber form the heart of Ancient Rome. 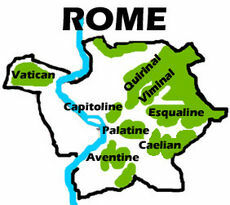 The original city was held to have been founded by Romulus on the Palatine Hill, and the other six hills are now called the Aventine, Capitoline, Quirinal, Viminal, Esquiline, and Caelian. The independent settlements on these hills began to unify into what is now known as Rome as the marshes between the hills were drained, and as inter-settlement religious games began to be held. But contrary to what William Branham stated, the Bible does not always represent the woman as the church. The Bible also does not state that "the church setting on the seven hills" is a false church. What it does say is that "the woman which thou sawest is that great city..."
Jerusalem itself had been pictured as a harlot by both Isaiah and Ezekiel. Likewise Nahum describes Ninevah’s barbarities in terms of “the wanton lust of a harlot, alluring, the mistress of sorceries, who enslaved nations by her prostitution and peoples by her witchcraft”. Similarly Isaiah’s litany over Tyre calls for her to “take up a harp, walk through the city, you forgotten prostitute; play the harp well, sing many a song, so that you will be remembered.” Lamentations, a lament over the fall of Jerusalem in 587 BC, portrays the fallen city as a woman “who has become like a widow” (Lam 1:1).The typing of the city of Rome to a woman and particularly a harlot is, therefore, imagery taken from the Old Testament, something that is common throughout the Book of Revelation. So William Branham was wrong. A woman in the Bible does not always represent a church - it often represents a city. And that is clearly what it does here, it represents the city of Rome. Rome persecuted the Christian church relentlessly once it turned on them. In fact, Nero ordered the death of believers in Rome using them as living torches for his infamous garden parties. The Neronian persecutions were but a small foretaste of the holocaust that would be periodically unleashed against Christians in the succeeding two centuries. ↑ See how the faithful city has become a prostitute! She once was full of justice; righteousness used to dwell in her — but now murderers! (The New International Version (Grand Rapids, MI: Zondervan, 2011), Is 1:21. ↑ Gordon D. Fee, Revelation, New Covenant Commentary Series (Eugene, OR: Cascade Books, 2011), 242. ↑ Philip D. Stern, “Ruth, Book Of, Critical Issues,” ed. John D. Barry et al., The Lexham Bible Dictionary (Bellingham, WA: Lexham Press, 2016). ↑ Gordon D. Fee, Revelation, New Covenant Commentary Series (Eugene, OR: Cascade Books, 2011), 98. This page was last edited on 31 October 2017, at 17:07.